Operating systems: Windows XP (or superior: 10, 8, 7, Vista, Server 2008, Server 2003). For the C++ library: Visual Studio 2010 (or superior). For the Python library: Python 2.7, Python 3.6 or Python 3.7. The python libraries are linked against the binaries provided by the official installers available on the python website. The use of third-party python distributions is not supported. Before anything else, please close all your opened terminals and IDE. 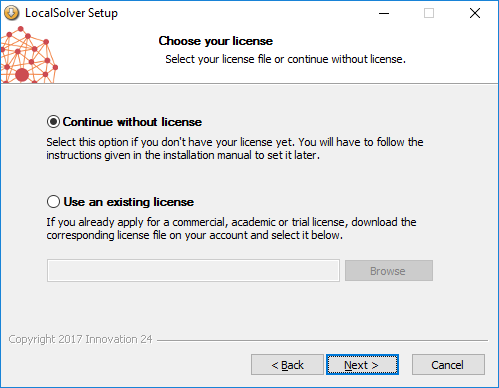 You must have administrator rights on your computer to install LocalSolver. 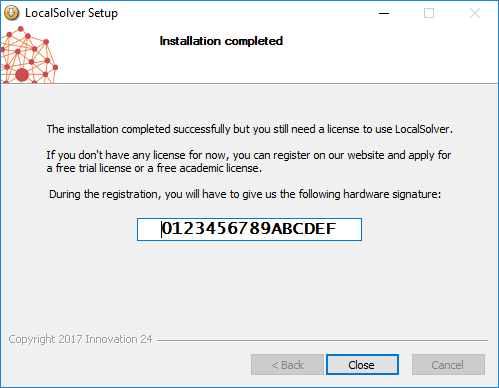 If you haven’t done so yet, download LocalSolver for Windows from the LocalSolver website. Then, launch LocalSolver_XXXX.exe and follow the given instructions. LocalSolver will be installed for all users. During the installation, you will be prompted to select your License file. If you already have a license, you can select it at this step and skip the licensing part of this documentation. You can change your license at any time by following the procedures described in this guide. Select your license file or continue without license. 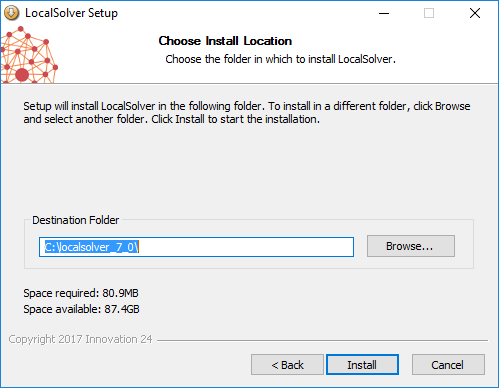 Choose the install location of LocalSolver and click Install to start the installation. 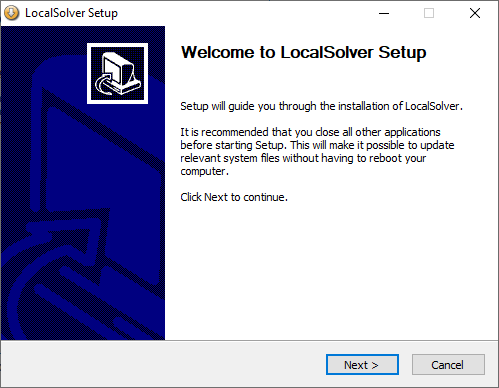 Note that you can install different versions of LocalSolver on your system but only the last installed version will be easily accessible from the command line. To use the previous ones, you have to use their exact path (eg. C:\localsolver_4_5\bin\localsolver). Except that, all versions of LocalSolver can work together without any trouble. 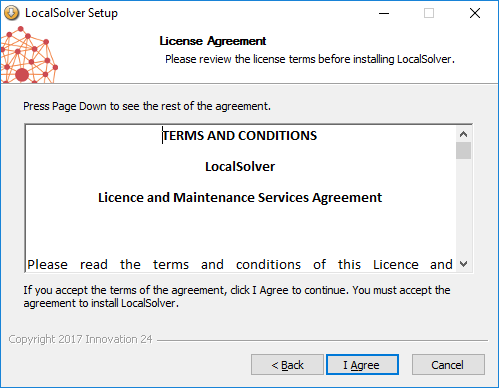 If you have not specified any license when asked, a page with your hardware signature will appear at the end of the installation. You will have to give us this hexadecimal number if you want to apply for a free trial license or a free academic license on our website. Copy the file license.dat downloaded from your account in C:\localsolver_XXX\. Launch lstokenserver.exe in C:\localsolver_XXX\bin. You need administrator privileges to run this application. This program installs and automatically starts the token server as a Windows Service. The token server listens on TCP port 7462. Normally, LocalSolver will automatically add the required exceptions to the windows firewall. If you use another firewall or if you have dedicated hardware to ensure your network security, please ask your system administrator to add the required rules to allow the trafic between the lstokenserver service and your applications. In the default location, C:\localsolver_XXX\license.dat. You must have administrator rights on your computer to uninstall LocalSolver. Then, go in your LocalSolver folder and launch Uninstall.exe.